The Phenom begins more or less midconversation. Most movies about a pro athlete in crisis start with the crisis, perhaps augmented by some sports-announcer boilerplate filling in the backstory, before depositing the athlete on the doorstep of some kind of coach or therapist. Maybe the nominally more inventive might start with the coach and flash back to the trauma. 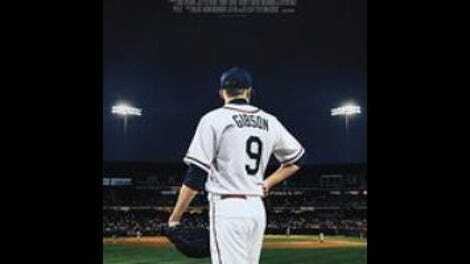 Noah Buschel’s film depicts only the briefest bit of on-field action in the career of Hopper Gibson (Johnny Simmons) before pulling back to reveal that he’s at a session with Dr. Mobley (Paul Giamatti), a sports therapist tasked with figuring out why a promising young pitcher who skipped college and went straight to the majors has been busted back down to the minor leagues. Buschel enters this scene with such confidence, and with so little concern for packing information into his dialogue, that the film becomes immediately, almost counterintuitively inviting. He can’t entirely transcend how rote The Phenom’s basic story is, but for long stretches he does a hell of a job working around it. The main cliché: Hopper has—get this—a domineering and emotionally withholding father, played by Ethan Hawke. He’s the kind of absent dad who rolls back into town unannounced after a long time away and forces his student-athlete kid to run suicides in the middle of the night and greater distances at dawn (and also rarely buttons his shirt all the way up, if he wears one at all). Hawke’s performance suggests a grim alternate reality for the initially feckless dad he played in Boyhood—someone who never learned how to be a father and instead settled into relentlessly pushing his kid for the kind of success he’ll never achieve himself. Hawke’s scene partner is almost always Simmons, one of those actors who’s been playing 18-year-olds for approximately the length of a full adolescence. Here, looking older and bulkier than he did in, say, Jennifer’s Body, he nonetheless suggests the vulnerability of a kid who has worked so hard at one thing that he isn’t sure how to do anything else, including take care of himself. If there’s a problem with the scenes between Simmons and Hawke—the final of which is understated and moving—it’s that Hopper, while clearly a damaged kid, never seems to have fully internalized his father’s selfish worldview. He says he needs to place his pitching above anything or anyone else, but Simmons is so good at regarding Hawke with skepticism without ever telling him off that his worst moments of doubt don’t make a lot of sense. Still, Buschel (who also wrote the screenplay) treats his imperfect material well. As seen in one of his earlier movies, the charming Sparrows Dance, he has a penchant for theater-style simplicity: intimate, dialogue-based two-person scenes that pay plenty of attention to his characters. But Buschel’s films don’t feel stagy, or at least they don’t have the confined, visually dull sensibility associated with that term. He composes static shots so long and push-ins so slow that they border on being show-offy despite a lack of surface flash. What these moments share with live theater is a refusal to make any scenes perfunctory, in this case by cutting away too soon. Sometimes Buschel manages to avoid cutting even when time passes, as when Hopper and a friend exit the frame to order in dinner, then the camera immediately pans to them eating some time later. Simmons, Hawke, and Giamatti are all compelling enough to ensure that The Phenom doesn’t turn into a bunch of empty tricks and fussy lighting. Buschel often supplies them with smart, well-written dialogue, though he doesn’t have much of an ear for how journalists talk, on air or off. (Marin Ireland, the lead in Sparrows Dance, has a bit part as a TV reporter who issues a pithy, overwritten summation of her profession.) Ultimately, his filmmaking is slightly more memorable than the film, even when the former hits right on the nose, as when Simmons, photographed from the passenger seat of his car, pulls up alongside a bus with an ad for Justified, so that Timothy Olyphant’s pistol points straight at his head. The Phenom is merely well-acted and well-made, rather than heart-stopping. There are worse fates for a sports movie, to be sure.